When she is performing, Carbonell considers herself a "mermaid"
(CNN) -- With a first name that means "wave" in Catalan, perhaps Ona Carbonell was destined to pursue a career in water sports. 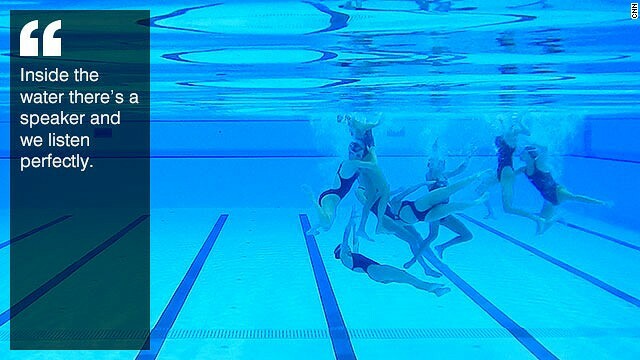 And for a self-confessed "mermaid," synchronized swimming provides the ideal escape. "I don't know why but the water, for me, it's perfect. I feel better inside the water than outside," Carbonell told CNN's Human to Hero series. 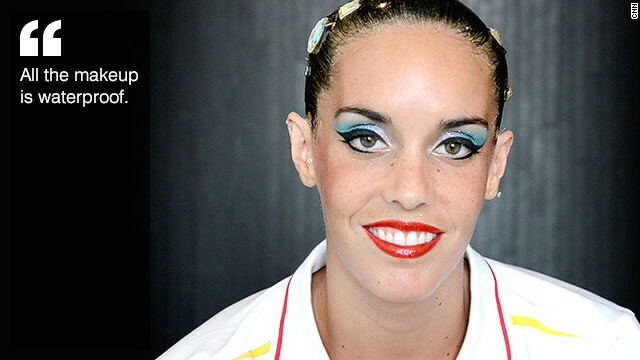 She has become Spain's most successful synchronized swimmer, collecting two Olympic medals and more than a dozen at the world championships. "You can do anything -- you can create and (be) very original. It's an artistic sport," she added. Then there's the glitzy outfits -- and the hair, which is lacquered into a hard gloss with gelatine to keep it styled in the water. Like Venus Williams in tennis, Carbonell -- who is studying fashion design at university -- and her teammates play a role in creating the costumes they wear. The collaborative approach also applies to choosing music to routines and developing the choreography along with their coaches. Carbonell's big tune is "Barcelona" -- the ode to her home city sung by Freddie Mercury and Montserrat Caballe, to which she performed at July's world championships in the Catalan capital. "It's the music of Olympics '92 and it's very nice song and very nice choreography -- I think it's very beautiful," Carbonell explains. "The costume is like Gaudi -- in Barcelona very famous -- and blue and shiny like Montserrat Caballe when she sings." The 2013 world championships were a special moment for the 23-year-old. She was able to get close to the countries now dominating the sport, Russia and China, as she earned seven podium placings across the individual and team events. But it's clear that for Carbonell, picking up silverware isn't her lone goal. Being underwater for 20 seconds at a time -- unable to even communicate with your partner -- adds to the feeling of peaceful isolation. It's an escape, however, that requires its participants to combine artistic elements with strength and technique, similar to rhythmic gymnastics or figure skating. On average Carbonell suspects she spends 10 hours in the pool a day -- a necessary workload if she is to catch her Russian and Chinese rivals. 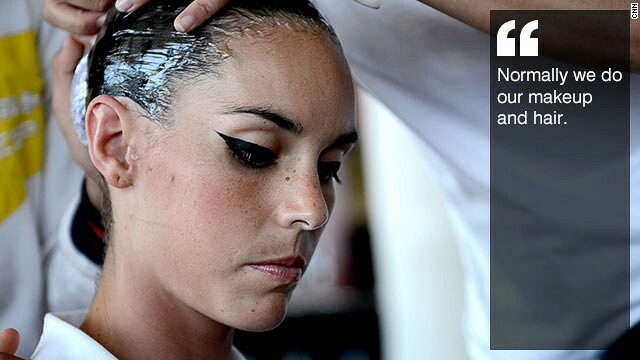 While twisting, turning and lifting, competitors have to make sure the strain doesn't show on their well-manicured faces -- sometimes they put the waterproof makeup on themselves but on other occasions they have makeup artists. Any sign of straining and the judges are sure to pounce. The degree of difficulty is thus high. Growing up in Barcelona, the vibrant city in northeastern Spain that rests by the Mediterranean Sea, paved the way for Carbonell's development in "synchro." "When I was seven I did rhythmic gymnastics," she recalls. "When I was nine I started synchronized swimming because I liked the water a lot. I spent a lot of hours in the sea." It prepared her well for a life in the pool, which requires strong stamina. "There are many hard things in synchronized swimming but the hardest is to hold our breath inside the water," Carbonell says. "When we go up and breathe, you have to do a good face and smile. "We have to work a lot to hold our breath because many moves in the performance are like 20 seconds without a breath. "We don't communicate -- it's impossible. Sometimes when we don't have music we speak inside the water but it's very difficult and without goggles you see very bad. "You have to believe in each other." In the team format that consists of eight swimmers -- one of the two Olympic disciplines, while there are seven formats at the world championships -- Carbonell and company are aided by underwater speakers. "We listen perfectly inside and outside, too, and it's nice because it's like all the other people," said Carbonell. "A lot of people don't know we have a speaker inside." Spain, with Carbonell in the group, claimed a silver medal in all three team events in Barcelona, finishing second to Russia. Individually she collected four bronze medals, with Russia once again leading the way. Russia's clean sweep of all seven gold medals confirmed its status as the powerhouse of the sport, unlike the early days. 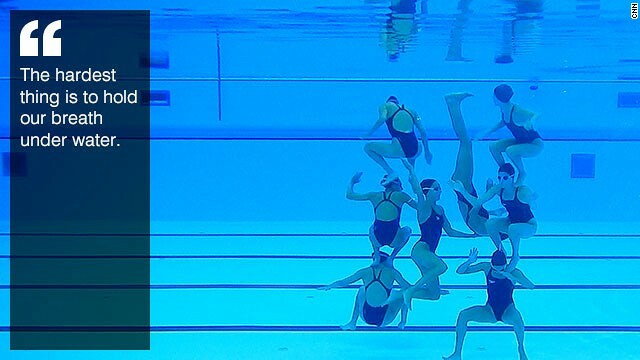 When synchronized swimming first became an Olympic sport in Los Angeles in 1984, Canada, the U.S. and Japan led the way in the absence of the East European nations -- who boycotted the Games in retaliation for the West's refusal to attend Moscow '80. "Russia is very difficult to get," said Carbonell. "China is difficult, too, but maybe I get." 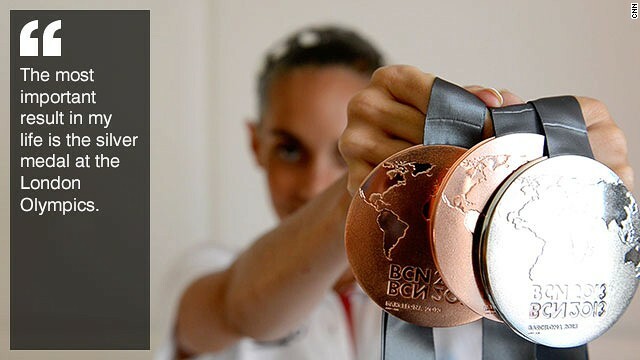 Carbonell did win gold at the 2009 world championships in Rome in the team free routine, but the highlight of her career remains tallying a silver in the duet and team bronze at last year's Olympics in London. Caught up in the moment, she was unable to appreciate her achievements. It was only when Carbonell went on holiday did she fully reflect. "I (thought) a lot about the competition -- 'Oh it's a very, very big thing that we did,' " she says. "For me, the most important result in my life is the silver medal in London because it's very hard to get there. I'm younger and my partner was like eight years older than me. Carbonell is now working towards the 2016 Olympics in Rio. "I think we go for gold, and work more, more, more," she says. As for later in life, Carbonell isn't the sort to predict what she will be doing in 10 years. She wonders, though, if men will be allowed to compete in international tournaments at some stage. For some, men and synchronized swimming are forever linked to a skit on U.S. comedy show Saturday Night Live decades ago starring Martin Short. 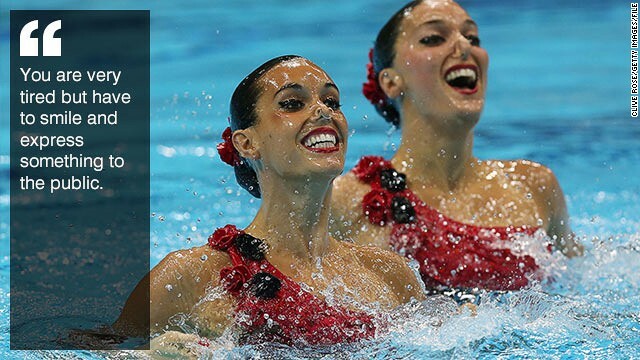 "I don't understand why in synchronized, there is not men's," said Carbonell. "In ballet there are men. For me it would be very good if men start to do synchronized swimming."